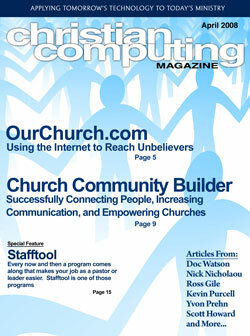 Recently, I was given the opportunity to write an article for Christian Computing Magazine. With Internet Evangelism Day scheduled for April 27 and OurChurch.Com focusing on Internet evangelism all month long, I decided to write the article about opportunities to reach out to unbelievers online. The April edition of CCMag came out yesterday. Here’s an image of the cover. Although the cover may give the impression the aricle is about OurChurch.Com, it’s really not about us but rather the broader opportunity individuals, organizations, and churches have to share the Gospel of Jesus Christ online. Church marketing is dying. Throwing a slick advertising piece or website at the public isn’t going to cut it much longer. The church of tomorrow will require more than a campaign. It will require investing personally and hanging out in people’s jacked up lives. 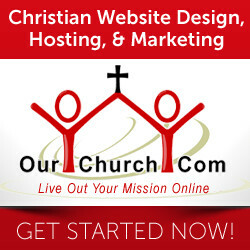 Church Marketing Online is a new website being launched today by OurChurch.Com. The purpose of Church Marketing Online is to help churches make better use of the Internet in their marketing, evangelism, and outreach efforts. We’re doing that in two ways. First, we’ve developed the Top Church Search Rankings service which puts a church website at the top of the search results on Google, Yahoo, MSN, and Ask for the phrases people search when looking for a church. This is key because most people looking for a church these days start their search online. And while most churches today have a website, very few have been optimized for search engines and very few churches are monitoring their search rankings and making adjustments on a regular basis to ensure people can find the church website. Second, we’re launching this blog where we’ll be posting articles about church marketing, Internet evangelism, and search engine optimization in an effort to help pastors and church webmasters better understand how to reach the people in their communities online. Not only will we discuss purely online church marketing strategies, but also how to maximize a church’s offline outreach efforts (personal evangelism, random acts of kindness, billboards, postcards, etc) by coordinating and complimenting them with an online efforts. The cornerstone of the CMO blog is what we’re calling CMO University. This is a series of in-depth articles we’ll be publishing over the coming weeks for the purpose of giving busy church leaders an understanding of Internet technologies and their application to church marketing and outreach. Thanks for stopping by. Please a comment and let us know what you think about the new site and let us know about any comments, questions, or issues you want to discuss regarding online marketing and outreach.